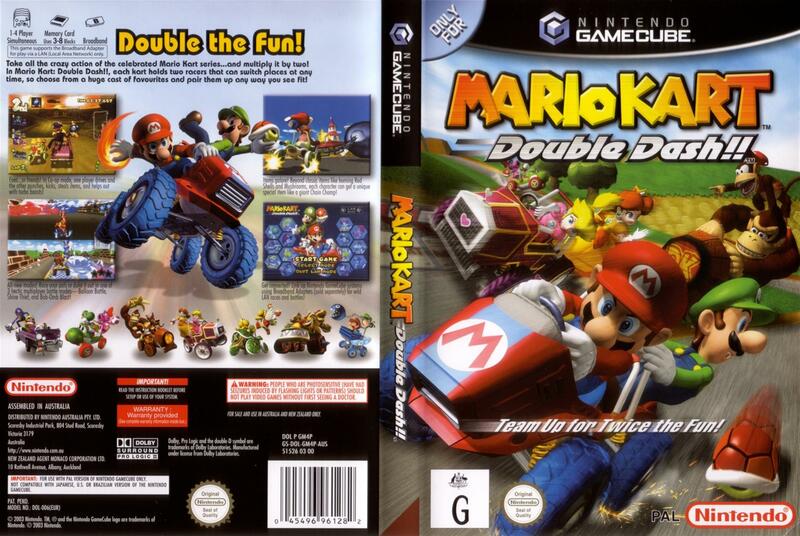 "Double Dash's gameplay is slightly different from other Mario Kart games. 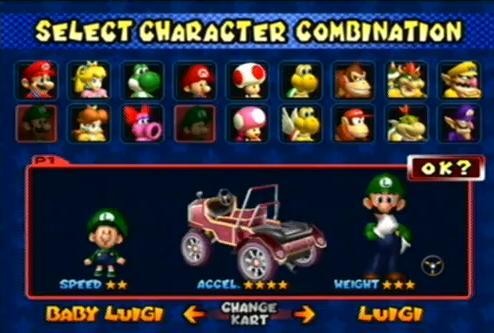 Instead of having one player per kart, there are two: one to drive, and one to use items. 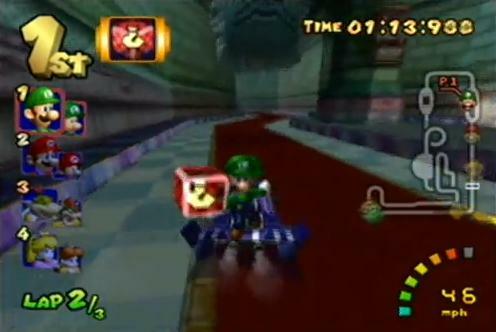 Players cannot hold items behind the kart, making it more difficult to block incoming shells. It is the first game in the series where players drop their items when hit by a weapon. Players can also steal items from the opponents. The powerslide technique has been improved; if the player manages to get blue sparks, a mini-turbo is performed. 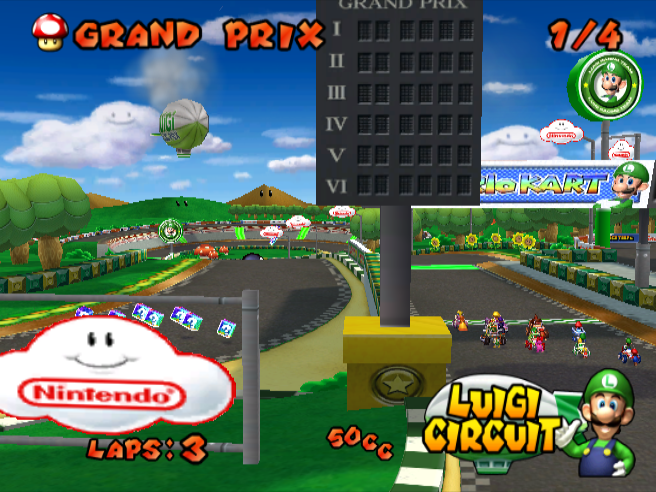 The game allows up to four players to compete in battle modes and two players in grand prix mode. As in previous installments, the battle arenas are enclosed, with varying architecture and a constant arsenal. In addition to the traditional balloon-popping battle game, two new games have been implemented: the first involves capturing a Shine Sprite and maintaining possession of it for a time period, and the other involves throwing Bob-ombs at each other. Players can choose from a cast of 20 characters, eleven of which are new to the series. Characters have their own special items, like Mario and Luigi with Fireballs, Donkey Kong and Diddy Kong with Giant Bananas, and Wario and Waluigi with Bob-ombs. 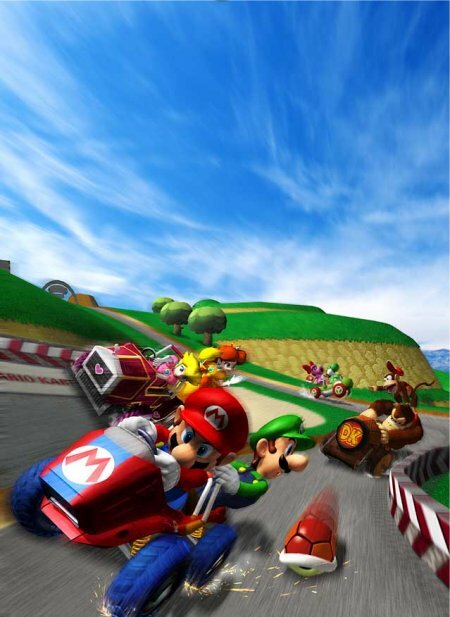 The character's weight class (light, middle, or heavy) determine the karts in which they can ride and their attributes in speed, acceleration, and weight. There are 16 courses, divided into four cups; a fifth cup, the all-cup tour, has the player race all the tracks. 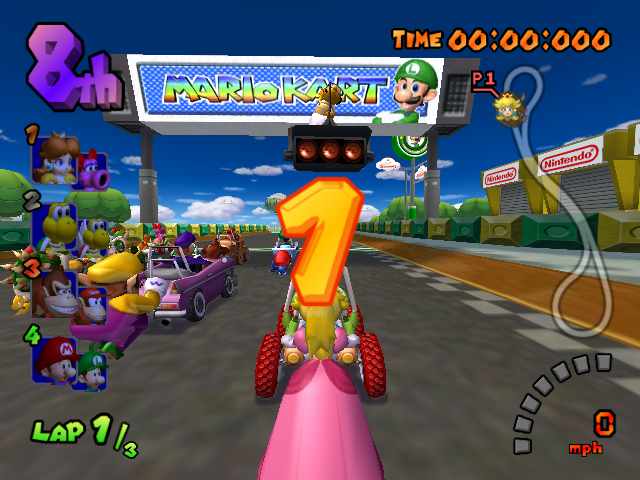 The all cup tour always starts with Luigi Circuit and ends with Rainbow Road, but the remaining fourteen tracks show up in random order. 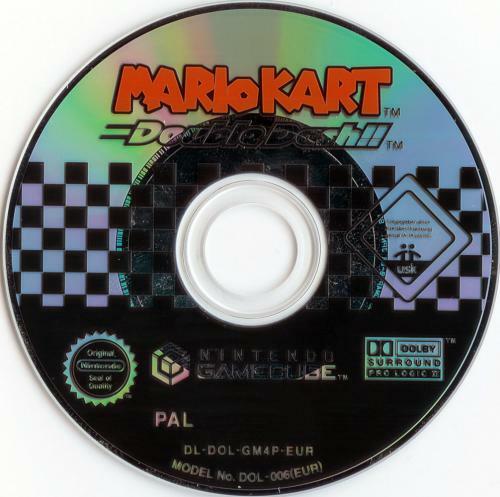 Each track is also playable in "Mirror Mode", available after winning the all-cup tour, in which the tracks are mirrored; this mode is only available for 150cc"
Yep, this game. This is my favorite racing game of all time. And why not? This game is loaded with a ton of characters, tons of courses, and fun modes to play with your friends. This time around, you can play as characters on the same kart. One drives and the other throws items. You will have a blast playing in the Grand Prix mode as you race to be the best racer in the game. The game also comes with VS mode so you can race freely with your friends and even battle with them. This is definitely a must have game and I suggest you try it our! One of the greatest racing games ever, if you are looking for one that isn't realistic that is. I'm just going to focus on the grand prix mode, in this description because you will probably spend 90% of your time on the game playing grand prix if you are anything like me. Double Dash features 16 tracks, split into 4 cups, and then the always fun all cup. 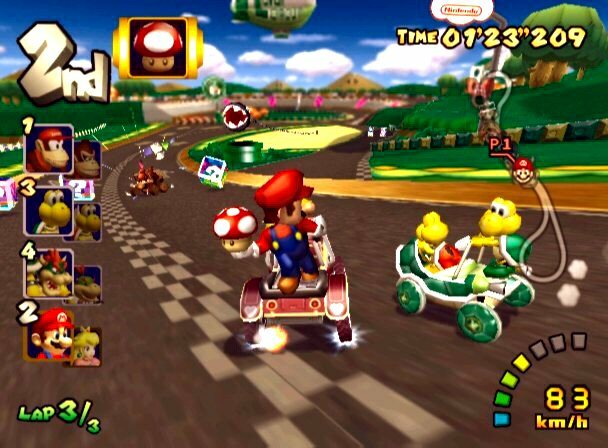 Like previous Mario Kart games, the difficulties are 50cc, 100cc, 150cc and then Mirror 150cc. In mirror the tracks are flipped (MIND GAMES). 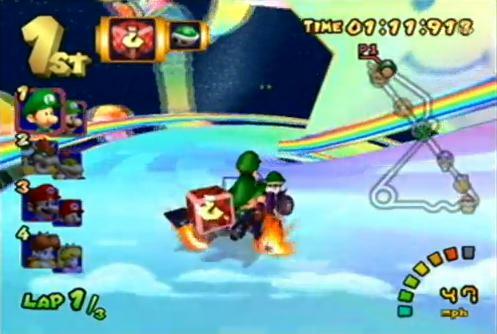 In the lower difficulties, the cars also operate slower, so the game does that feel so fast paced. As a result your boosts are less powerful, same with power sliding. Every time you play a grand prix, there is always one CPU team that is "the team to beat" This one duo is pretty much going to be your only competition at all except for a few tracks on 150cc another duo could give you some issues. In double dash, you ride two people per car. This allows you to potentially hold items with both of your characters, and can easily switch driver with item thrower by pressing Z, or by using the item your back seat person is holding and if your front seat is holding one, they will automatically switch. Cars are divided by weight (as are characters). The characters weight you choose determines your cars. In addition, if you mix a light with a medium, you can only choose medium cars. Characters are divided into "duos". Mario and Luigi, Toad and Toadette, Wario and Waluigi etc...these duos share the same special item that you can get with more frequency when you are behind. It is best for you to mix and match characters so you can get two special moves, depending on who is sitting in the back seat. My only complaint about this game is if you have 3 or 4 players and want to race each other. Once you get the 3rd player, there are no longer any computers in the race, just the 3 humans, and this holds true for 4 human players as well. 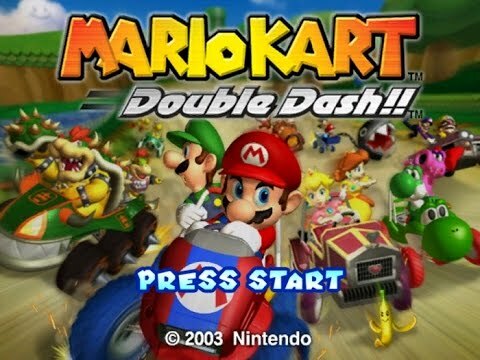 Mario Kart Double Dash is a game where the famous Mario, karts and plays with some of his friends like Luigi, Koopa, Princes Peach and Bowser. It is definitively one of my favorite games and a nostalgic one too. 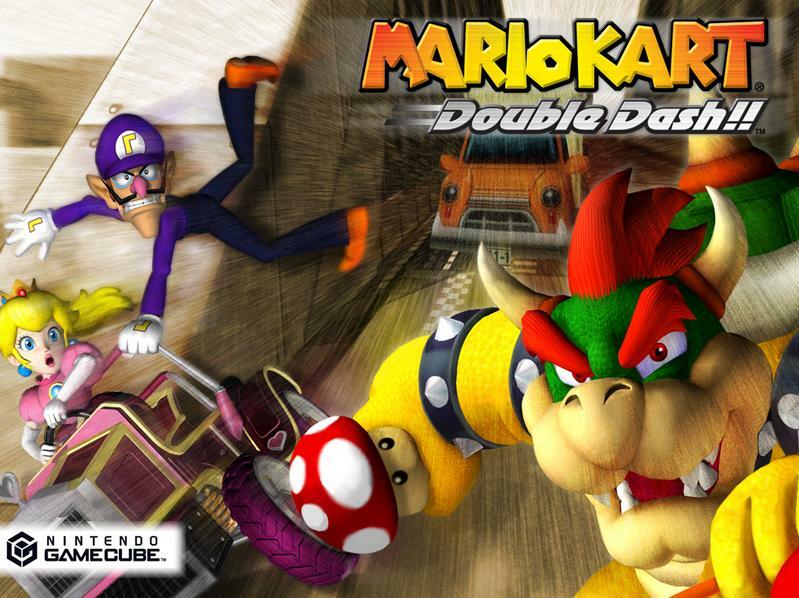 Read all 6 reviews for Mario Kart Double Dash Submit your description for this title! Now you can add videos, screenshots, or other images (cover scans, disc scans, etc.) for Mario Kart Double Dash to Emuparadise. Do it now!